This film will translate wonderfully to the small screen. It's a great lazy-afternoon, curl-up-on-the-couch romance. LaBute's casual but comprehensive commentary track is a great listen -- especially for fans of A.S. Byatt's novel. The writer-director addresses all the changes he made, including turning Roland into a brash American to create more sparks with Maude. He speaks very lovingly of the novel and the difficult choices that had to be made in paring it down into a screenplay -- character changes and consolidations, scenes dropped or rearranged, etc. But this track is fascinating in and of itself, as LaBute covers technical details with delight, speaks to the nuances of the performances, and addresses the essential elements of creating contrasts and parallels between the film's two time periods. If I have any complaint, it's that he talks so much he even talks over dialogue he's alluding to in his commentary. Interweaving two hindrance-hurdling love stories that share a literary connection but take place more than a century apart, director Neil LaBute has taken another large and confident step into an unexpected genre with gratifying results. "Possession," which is lovingly but sometimes loosely adapted from A.S. Byatt's novel of the same name, follows the germinating romance between two relationship-reluctant academics as they in turn follow a trail of evidence revealing a passionate secret affair between two Victorian poets. A wild departure from LaBute's previous films -- the caustic, even cruel social satires "In the Company of Men" and "Your Friends and Neighbors," and the upbeat black comedy "Nurse Betty" -- this effort has the melodic trappings of a Merchant-Ivory romance. But it's also a perceptive musing on what has and hasn't changed between the two time periods in the emotional, practical and sometimes prohibitive logistics of love. In present day, the picture stars LaBute regular Aaron Eckhart as Roland Michell, a charmingly cocky, brusque and scruffy American scholar in London on a fellowship to study a celebrated Victorian poet named Randolph Henry Ash. His startling discovery of a love letter the married and famously faithful Ash wrote to a mistress -- a letter the brazen Roland surreptitiously sneaks out of a dusty academic library -- leads him to Maud Bailey (Gwyneth Paltrow), a fastidious young British professor who is researching the life of Ash's suspected lover, another Victorian poet named Christabel LaMotte. At first Maud won't have a bit of it, well aware both Ash's reputation and the fact LaMotte quietly lived with a lover of her own, a woman painter. But persuaded by Roland to follow up on a clue, together they sniff out a stash of passionate, 1860s correspondence between the two poets hidden in the manor where LaMotte once lived. As the scholars follow a trail of written evidence across England, the thrill of their quest and its potential significance begins to wear down their mutual modern cynicism toward love, and a complicated, cautious romantic chemistry begins to form between them. Retracing the steps of two lovers that each of them are devoted to as academics kindles a skeptical desire for each other. 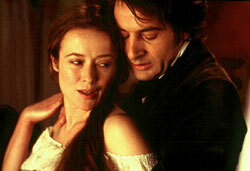 Meanwhile, the discoveries they make about the liaisons between Ash and LaMotte are played out in a parallel timeline featuring the underrated and brilliant Jeremy Northam ("Gosford Park," "An Ideal Husband") and Jennifer Ehle ("Sunshine," "Wilde"). In a full-court press of warmly melodramatic period flavor, the two poets elude 19th Century social mores and constrictions to be together in what becomes a fervent, ultimately tragic but slightly hopeful romance. LaBute demonstrates a strong command of cinematic language, seamlessly marrying an elegant, velvety visual signature in the 19th Century scenes with the completely modern style of his present-day story, which includes energetic tracking shots and a tangy sense of humor. As Roland and Maud literally follow in the footsteps of Ash and LaMotte, the director cleverly transitions between the two periods by panning from the past to the present across the same room or showing the poets leaving a location by train, passing over a trestle just as the academics arrive there in a car passing under that same trestle, 100-plus years later. The biggest departure LaBute and his script collaborators --- David Henry Hwang ("M. Butterfly") and Laura Jones ("Portrait of a Lady," Angela's Ashes") -- made from Byatt's book was to recast Roland as an American. The change has been denounced in advance by fans, but it provides an extra, entertaining contrast between the unorthodox scholar and his musty, literally old-school environment. It also inspires sparks and additional obstacles between the modern lovers that give the film great texture. Eckhart does a sublime job of exposing Roland's inner sensitivity that is deeply affected by Ash's poetry while embodying his personality as a brash, unshaven, sometime crude all-American guy most comfortable in worn-out T-shirts. As Maud, Paltrow finds all kinds of new nuances to the polished, upper-class Brit persona she seems born to play, despite being an American herself. The chemistry between Roland and Maud is very well played by these two fine actors. You can feel the romantic vines intertwining as they spend time together. They're connecting -- often against their better judgement and with a lot of resistance -- in a way that make it harder and harder for them to pull apart. The relationship between Ash and LaMotte is more stirring, but not as well defined -- although this may be deliberate since our entry into their lives is understood largely through the eyes of our modern heroes, who can only draw conclusions from what they read in the letters between their 19th Century counterparts. A few scenes in "Possession" ring false, especially when it comes to a subplot about glory-seeking rival scholars who are willing to become literal grave robbers to profit from Roland and Maud's findings. But the film never stops providing new and enticing discoveries, right up to the very end -- and that is the crux of the movie's appeal.